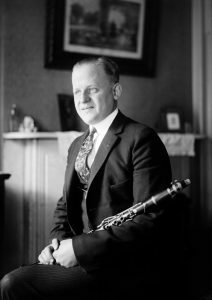 The clarinet player who could arguably be said to have had the most influence on the history of twentieth century classical music is not a household name, nor even remotely famous now, but it’s no exaggeration to say that Ross Gorman, who created the famous introductory clarinet wail at the start of Gershwin’s Rhapsody in Blue, made musical history and helped set in motion a new creative movement. 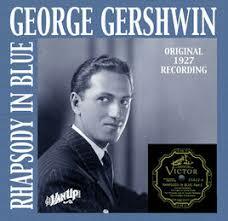 George Gershwin was hesitant at first about writing Rhapsody in Blue. The legendary band leader, Paul Whiteman, had requested it for a concert he was planning designed to blur the boundaries between jazz and classical music entitled An Experiment in Modern Music. In the end Gershwin was more or less shoe-horned into the commission when, five weeks before the event, he read an article in the New York Tribune announcing that he, Gershwin, was writing a jazz concerto for Whiteman’s forthcoming New York concert. It goes without saying that Gershwin’s melodic ideas in Rhapsody in Blue are second to none – jazzy and exciting, both sentimental and hard hitting – but credit should also be accorded to Frederick Grofe who, perhaps because of the short deadline, was drafted in to orchestrate the new piece and who presumably chose the clarinet to colour the opening. And this is where our man Ross Gorman, Whiteman’s virtuoso clarinettist, comes into the picture. Gershwin had written a simple scalic run up to a top B flat to prepare the ground for the Rhapsody’s first piano entry but Gorman came to the rehearsal wanting to get a laugh or maybe even to raise the composer’s hackles. He sat down and, instead of playing a scale of precise notes, he did something quite revolutionary for a classical work: a glissando all the way up from the bottom of the clarinet’s range to the top. This technique of sliding between notes and slowly bending and merging pitches until they reach a climactic top note, borrows and extends jazz technique of the time. The effect on everyone present would have been electric. Rather than a look of annoyance from the composer, Gorman’s “joke” met with immediate approval and Gershwin asked Gorman to do the same thing in the concert performance with as much of a wail as possible. Reports of this momentous 1924 concert indicate that it had its longueurs but that the clarinet wail opening Rhapsody in Blue really made people sit up and take note of Gershwin’s revolutionary piece. There was much applause, if not critical success, and the Rhapsody soon sold a million copies. American clarinetist, known for his improvised glissando in George Gershwin’s ‘Rhapsody in Blue.’ Photograph, c1920. Gorman’s playing gets close to the sound of laughing. His brilliant control of the slides and the vocal techniques used by jazz clarinettists has its roots in African American musical traditions as well as in the Klezmer music of the Jewish community. The serious music press disapproved of this uninhibited style of playing which, according to one critic of the time, belonged to the farmyard and should be kept out of the concert hall. By allowing a clarinet glissando to preface Rhapsody in Blue, Gershwin opened the door for down to earth, working people’s music to influence high culture. The music of the people was finally being allowed to infiltrate the hallowed realms of the concert hall. Rhapsody in Blue continues to be one of the most performed classical works of all time and surely that is in no small measure down to Gorman’s defiant, sassy and poignant opening clarinet call. Hear me explain how to play a “gliss” on the clarinet to Lenny Henry in the BBC’s new television series about twentieth century classical music, Our Classical Century , airing in November.